Our son and daughter-in-law were recently married and chose this sight as the hotel for their guests. We had an excellent experience. There was a total of 48 rooms booked for the weekend and each room was absolutely beautiful. Our visit and experience was wonderful; starting with Sandra at the front desk; the cleaning staff, breakfast attendant and restaurant/lounge staff. The shuttle service provided to our guests for the dress rehearsal party and the wedding reception was timely and well organized throughout the event. 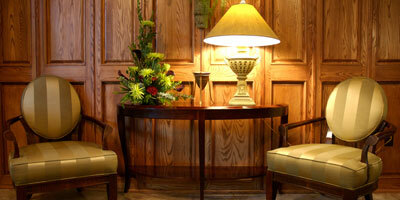 Guests were able to have early check-in and the rooms were immaculate. The size, cleanliness and amenities offered by the rooms at the Ramada Inn-Saginaw are of the same caliber that you would expect at a 5-Star hotel. We would recommend this facility to anyone needing a wonderful stay in the Saginaw area. -Deanna P.
I have stayed here multiple times for extended periods during rotations in medical school. The room is great and service is excellent. -Nini A.
I stayed at the Ramada Inn Saginaw for their New Year's Eve Celebration. I was pleasantly greeted by the friendly staff. They had a Hollywood Theme and my room was decorated with a Hollywood star and complimentary bottle of champagne with an autograph picture of the famous Dean Martin - what a nice touch! The room was very clean and comfortable - the party was fantastic and the band was outstanding - I think I will definitely consider this hotel for next New Year's Eve! Everything was wonderful and I would recommend this hotel to anyone traveling into Saginaw for business or a getaway! -Alexis G.
I recently hosted my daughter's wedding, and had my family and friends stay at the Ramada for this event. They were all so impressed with the large beautiful rooms and suites. I really appreciate the friendliness and professionalism of their staff, especially Tamera. I will definitely continue to use the Ramada and highly recommend this hotel. -Helen H.
Beautiful Hotel, We Will Be Back!! Everything about this hotel is great, the rooms are beautiful and the cost is fantastic. From the time we checked in, everyone (Staff) until we left were very attentive to our needs. I highly recommend this hotel if your planning a visit to Saginaw, you won't be disappointed. -Laura P.
Possibly THE BEST hotel experience I've had!